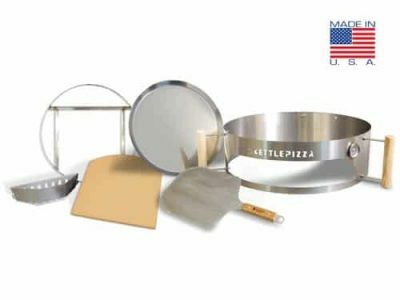 If you are looking for the top of the line KettlePizza kit, then the Serious Eats Special Edition kit is for you. 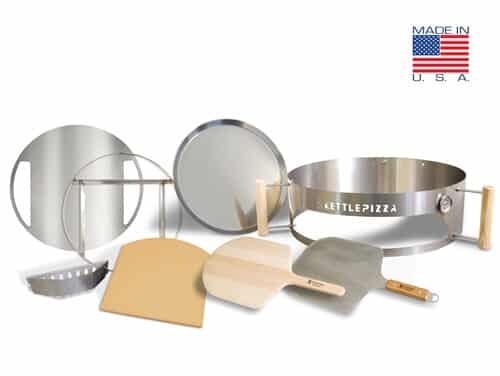 Inspired by the team at Slice Serious Eats, this combination of top-quality American Made components yields the highest dome temperatures and fastest cook times required for Neapolitan style pizza. Customer service and shipping is A#1. The product itself if fun but tricky. Like Sal, I cannot keep the crust from burning when up to temperature. I’m beginning to think that classic Napoletana might not be possible (though I’m not giving up). I’m going to experiment with temps and adding the pizza stone after fire already started. Next experiment will be with a NY pizza dough recipe–which can withstand high temps for a longer period of time. My package arrived in a matter of days and intact – very nicely wrapped to minimize damage. Looking forward to using it this weekend! 2 small observations: the hot box is a strange shape and not symmetrical and may be one that goes down the side rather than the back of the kettle but it’s a small matter; I also didn’t realize that I would be charged duty/tax on delivery. Great product. Still having a little difficulty from keeping the bottom crust from burning. Received and set up our serious eats KettlePizza Special Edition. Directions for set up and cooking were clear and everything went as described. The pizza we cooked were the best we have done on the grill and just as shown in the promotional videos. I highly recommend this for those that are dreaming of building you own outdoor bread/pizza oven. I am in love with my stainless steel Serious Eats KettlePizza Special Edition Kit! Set-up was super easy and it was at temperature in twenty minutes and pizzas were coming out a few minutes later. 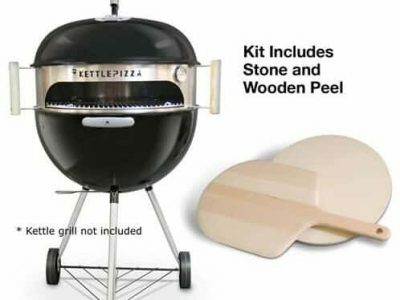 Received my KettlePizza kit in perfect condition and went to work right away putting it on my new grill. Everything fit perfect. As soon as I get some flour I will fire that baby up! Can’t wait. 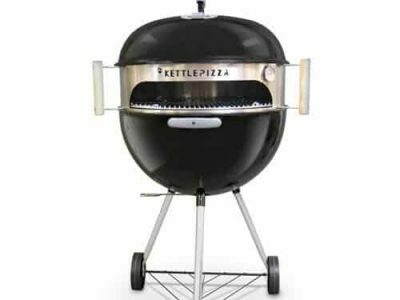 Great product, I would recommend it to anyone looking for a wood fired pizza oven. Al Contarino of Kettlepizza and Andris Lagsdin of Baking Steel got it right with this kit! Absolutely amazing! Anybody that wants authentic pizza without the expence of a brick oven in the backyard,this is the kit to get. Incredible!! I got the Serious Eats Special Edition kit (delivered in 3 days), and had it assembled in a few minutes, no tools necessary. I used it for the first time a few days ago, and it worked perfectly, cooking great-tasting pizzas in less than two minutes (I used Pillsbury pizza dough, and now I’m making my own dough). On Sunday I’m having a family reunion pizza party. This is a brilliant invention and great product. Get the KettlePizza kits for your Weber Kettle, and you will never look back! Package arrived in good shape, items within well packed and protected. Assembly instructions were straight forward and assembly itself was simple. 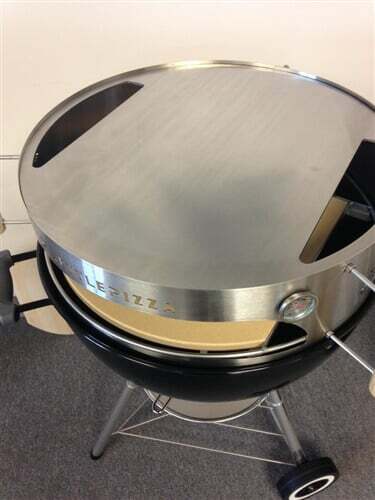 Looking forward to maiden launch of my new Kettle Pizza oven this weekend! I haven’t used the product yet, but wanted to attest that I had a great shopping experience. Product received in excellent condition. The packaging was exceptional. Easy to assemble. The product worked great on my first try. Can’t wait to see what else I can do with it other than pizza. Haven’t tried the item yet but the people and service here are excellent. They said to call them if our pizza doesn’t come out perfectly cooked and they will give us some tips on hot perfect the process. Pizza adaptor showed up on time and in perfect shape. So far I’m really happy with these folks.